the general recruitment of UPSSSC Competitive Exam 2018. There are total 181 Mandi Nirikshak vacancies are available in this UPSSSC recruitment 2018 of Mandi Parishad. Eligibility criteria having candidates can apply online on or before 26/12/2018 for this Mandi Nirikshak jobs using official website of UPSSSC @ www.upsssc.gov.in. This Market Inspectors recruitment of UPSSSC will be conducted in two stages. See the below given details for available Mandi Nirikshak vacancies, age limits, Market Inspector qualification, and online application process for UPSSSC Market Inspector (Mandi Nirikshak) general recruitment exam 2018 notification. 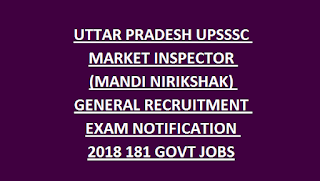 Click here to see the official notice of UTTAR PRADESH SSSC Market Inspector (Mandi Nirikshak)Recruitment. The candidates must have qualified Degree for applying this MI jobs. Desirable Skills: Agriculture Market related experience is required. For Mandi Nirikshak posts age limits as on 01-July-2018 is 21-40 Years. For SC/ST 5 years and OBC candidates 3 years of upper age relaxation is given. Selection for this UPSSSC Market Inspector recruitment 2018 will be held based on objective type multiple choice OMR based or online based written test and personal Interview. Written test qualified candidates are only called for the personal interview based on merit in written test. Apply online through official website of www.upsssc.gov.in from 05-12-2018 to 26-12-2018. Admit Card, exam syllabus, exam result and other details are available in this website only. Click here to apply online for the UTTAR PRADESH SSSC Market Inspector Recruitment 2018. 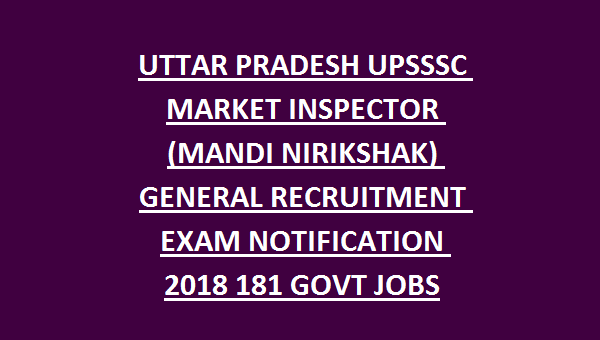 Please share this UTTAR PRADESH SSSC Market Inspector (Mandi Nirikshak) Recruitment Exam 2018 article to your friends via social pub sites such as whatsapp. Facebook, Google Plus and Twitter.